Campaign fliers from the 1982 congressional campaign of Democrat Richard Stallings. Oral Histories: 1977-1978, 20 interviews. The Teton Dam Disaster Oral History Project was conducted with various persons by Richard Stallings under the auspices of Ricks College, Idaho State Historical Society, and Utah State University History Department. Papers: 1984-1995, 104 cubic feet. 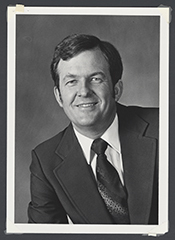 The papers of Richard Stallings document his tenure in the U.S. House of Representatives as well as his work as U.S. Nuclear Waste Negotiator. The collection contains constituent casework and correspondence; photographs; videos; newspaper clippings; Government publications; campaign materials; and memorabilia, with special emphasis on agricultural issues, the environment, energy, the Idaho National Laboratory, and Idaho politics and politicians. Videoreel and Videocassettes: 1986-1990, 1 commercial on 1 videoreel and 17 commercials on 8 videocassettes. The commercials were used during Richard Stallingss campaigns for the 1986, 1988, and 1990 U.S. congressional elections in District 2 of Idaho, Democratic Party.